In just one day, you'll get a mere glimpse of Prague, but beware: it will surely whet your appetite for more, and you may have to extend your stay in the end! Historic building around every corner, spires in almost every view – sightseeing in central Prague can feel overwhelming at first. But Prague is a wonderful city to stroll around (if you don't mind the cobblestones). Take time to wander down its narrow streets, savour every mouthful of delicious food and every sip of great beer, but - most importantly - resist the temptation to follow the crowds of tourists and sightseers. Our advice to anyone who finds him or herself with 24 hours to spare in the Czech capital is to stop, breathe, appreciate, indulge and maybe try some of these ideas. Start the day with the Prague Castle, the most noticeable and impressive of Prague's landmarks. Come early in the morning and enjoy the place's history without hurry. Take a leisurely wander around Hradčany (If you're facing the castle gates, go to the left, follow the gardens and castle walls and then pass the square until you get to some smaller streets. Wander around, be sure to visit Nový Svět, don't miss the tiny pink house at the end of that street) and look up for impressive architecture without fear of bumping into other tourists. Secreted in a valley that used to be the northern moat of the Prague Castle is a pedestrian tunnel linking deer gardens on either side of the Powder Bridge. This simple 2002 creation by architect Josef Pleskot of AP Atelier is off the beaten track and all the better for it. Halfway through the tunnel is a niche with the remains of the preserved foundations of the original Renaissance bridge on display. Move up the moat's slope to the plateau, where you find Eva Jiřičná's first building in Prague, the Orangery in the Royal Garden. Walk down the Petřín Park, former vineyards, a beautiful collection of lawns, orchards and pavilions, and treat yourself to breakfast at Café Savoy. Sit at a window table overlooking the leafy square outside and order one of several all-day breakfasts (we recommend Savoy Breakfast with a juicy portion of Prague ham served with horseradish and grain mustard. Tip: Book a table in advance and save place for dessert). After the breakfast, take the 12 tram for a trip past the sites of Malá Strana and on towards the Holešovice district and the DOX centre for contemporary art, which has the potential to kick-start the gentrification of the northern part of Holešovice. David Černý's famous Entropa sculpture was shown here in early 2010, with further edgy shows soon following in its footsteps. 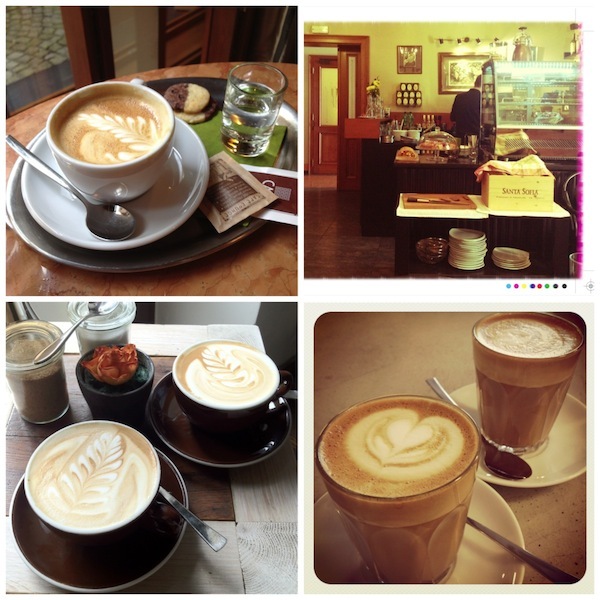 Unless you had a coffee at the centre's roomy terrace, visit arguably the best coffee house in Prague, Muj šálek kávy (which translates as "My cup of coffee" in English) and enjoy every sip of a perfectly prepared cappuccino. With your caffeine addiction well fed, climb up the steep Vítkov Hill and enjoy an exquisite view of Prague. Even though the austere National Memorial looks like it was build by the Soviets, it was actually completed before the Communist era. Now run by the Czech National Museum, it boasts impressive interiors, and hosts a permanent exhibition on 20th century Czechoslovak history - a great way to learn about Czechoslovak history and the life in Czechoslovakia in the past century. Now take the subway and after just ten minutes (take the C line to the “Vyšehrad” station), you'll find the best kept secret in Prague – Vyšehrad. Situated on a rocky outcrop just south of the centre, Vyšehrad (which means “castle on the heights”) offers a stunning view looking back over the city and Prague’s ‘main’ castle. The Vyšehrad Park is a perfect spot for a picnic or a romantic walk on the winding path that offer sweeping views. The area also houses the splendid Vyšehrad cemetery where many famous figures of Czech and European culture and science were laid to rest: look for a map directory of the famous names at the entrance. Now it's time for a traditional Czech dinner! Depending on your budget, head over to either La Degustation Boheme Bourgeoise, Čestr or Lokál. Eating at the former is a memorable experience, and with such impressive food and wine pairings, the real surprise is that the restaurant is yet to receive a Michelin star (we blame the biased Michelin commissioners). Tip: have a piece of smoked beef tongue with chickpea puree and pickled shallots and bear in mind that the LDBB has no a la carte menu and that each of the seven courses of the Bohemian tasting menu is preceded by its own amuse-bouche, so reserve at least three hours for a meal. We love Cestr – this Czech Steak House reminds us so much of our childhood. Inside, the restaurant feels like a butcher's shop: clean, bright and metallic; a place you know uses only top-quality meat. Beyond the atmosphere, Cestr truly triumphs on the plate – real Czech recipes, composed of Czech ingredients and prepared by Czech chefs. Pick up your piece of meat from the menu printed on paper, folded around a cardboard "map" of cuts from a cow. Tip: splendid beef tartar, superb steaks, rich gravy, homemade fries, Valhrona chocolate cake with homemade peanut ice cream, tank beer and poppy seed buns in vanilla crème. Lokál brings the traditional beer hall concept bang up to date. The interior features wooden wall panels decorated by graffitis and a glass bar counter housing stainless-steel barrels and cooling pipes. Do not expect fine dining, but rather “like mum used to make” food, lots of locals, low prices and great beer. Enjoy either fast and high-quality meals such as pickled cheese, headcheese or sausage made by the Dolejsi family of butchers from Davle, or bigger, regular meals like Beef Tenderloin with Cranberries; Pork, Dumplings, and Cabbage; or Roast Duck with Red Cabbage. Tip: Waiters will keep bringing you extra beer if you finish your first glass, so make sure you say "no" before it's too late. In the evening, take a twilight cruise of the Charles Bridge. The crowds along this biggest tourist attraction begin to thin out as the sun sets. The shadows fall and the statues become silhouetted by the remaining light. It’s a magical place to be at this time of day. Make sure that you spend some time on Kampa Island, which is just off of Charles Bridge. Walk through the park and enjoy the view of the bridge and across the river. And finally, there's no better place to end the night than in one of Prague's bars. Go to the Hemingway Bar and try Absinthe with cold water dripped over a sugar cube into the drink (that makes it significantly more palatable) or head to a small, very pleasant Vinograf Wine Bar and discover wonderful Czech wines. Have a wonderful stay whatever you are up to and remember: stop, breathe, appreciate and indulge. What are your tips for getting the most out of the city?